As someone who grew up in Georgia during the ‘90s, there are certain surface-level elements about the low-ball action flick Blast that speaks to both nostalgia and personal interest levels. Naturally, the location for the film's setting -- Atlanta during the '96 Olympics -- holds some inherent appeal, but the co-star of the show happens to be Linden Ashby, whose noteworthy credits don't extend very far beyond his cheeky turn as Johnny Cage in the not-so-guilty pleasure videogame adaptation of Mortal Kombat. For those reasons, and those reasons alone, the urge stuck me to dive into the thriller from Cyborg and Sword and the Sorcerer director Albert Pyun. Flickers of martial arts physicality telegraphed by Ashby aren't enough to defuse this bomb of a low-ball blockbuster, though, a dull copycat that for some reason doesn't use its novel, albeit superficial differences to ignite its own individual spark. Let's try to paint a picture here: imagine the high-rise building in Die Hard, and the terrorist shenanigans happening within, with a giant hand above the skyscraper and another underneath it. Then, picture the building squished between those hands into a much more compact location, with all the captive people -- this time, an Olympic swim team -- hanging out in the pool room within. Sub out Willis as a badass police officer with Linden Ashby as a blue polo-sporting "janitor", and you've basically got the gist of Blast. Terrorist have locked down the aquatic facility where the US swim team has been practicing, and it's up to an unassuming custodial worker (Ashby) with his own Olympic history to save ‘em, made more personal by his (ex-)wife being one of the coaches of the captive team. From the outside, an enigmatic counterterrorist agent (Rutger Hauer) assists how he can, while also referencing past events in Vienna that sound more intriguing than what's going down onscreen. Of all the locations used for the '96 Olympics, it's probably safe to assume that Georgia Tech's aquatic center -- where the water events took place -- could be the least distinctive and easiest to duplicate place without visiting Atlanta, doable at just about any other swimming lap pool with lighter walls and a few windows. Blast does its damnedest to keep any and all action happening within the pool area or through the corridors and stairwells outside of it, which makes for a visually tedious location flanked by stale-colored walls and L-shaped hallways. The network of locker rooms, police surveillance hubs, and external office buildings all come across as perfunctory areas that do nothing for those who might be drawn to the Olympic setting as a unique atmosphere for suspense. The most signature "Atlanta" thing about Blast? A radio DJ refers to the city as "Hotlanta", to the collective groans of the city's population. If the thrills are good, that doesn't matter, right? Logic issues don't have to interrupt a singularly-focused flick like Blast, which can endure "bad" choices made by either the heroes and villains so long as they lead into appropriately tense scenarios after. They become problems whenever those decisions and reactions contradict how they've acted early on, and, boy, does Albert Pyun's action film struggle with that, especially involving the villains. 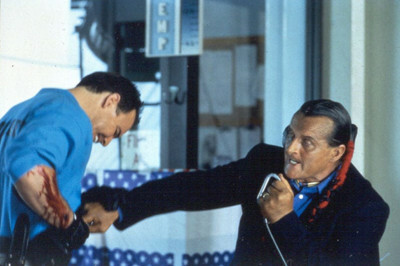 Ashby's cloak-and-dagger maneuvering around the swimming facility only happens because … well, the trigger-happy terrorists give him the chance to do so. Andrew Divoff's Hans Gruber stand-in and his cronies have zero regard for human life and systematically kill anyone who's a variable, yet they decide to let certain people -- whom they've watched and tracked from the start -- go about their business instead of proactively chasing them down and eliminating variables. Sure. None of the suspense, violence, or hand-to-hand action ends up being anywhere near strong enough to justify the blunders in Blast. Despite a shimmer of potential in the concept itself, writer/director Pyun's clunky character development splashes together with the predictability of what transpires -- again, yeah, if you've seen Die Hard, you're ready -- into a terrorist rescue mission that's about as predictable and monotonous as watching someone doing backstrokes in a lap pool. 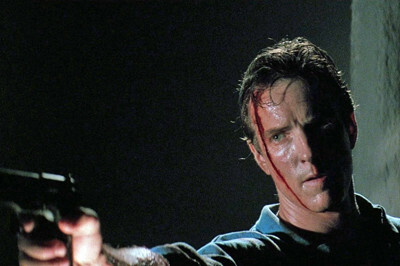 Linden Ashby enjoys a few moments where his martial-arts skills are allowed to shine, which have been awkwardly written into his janitorial character's small toolbox of abilities, and I dig that his character has to cope with a past injury while doing so; the execution of something similar was frustrating in The Rock's Skyscraper. He ain't John McLane, though, and the absence of that kind of personality can really be felt here. Top it off with Rutger Hauer's tacked-on extended cameo, and Blast just never really had a chance. Blast might not be a visually exciting piece of work, but it's built on a strong 35mm foundation that can yield impressive colors and detail. MVD Visual have carved out a niche for themselves by presenting unexpected, somewhat neglected films in better-than-expected Blu-ray packages, and their transfer here shores up yet another example of that, captured in a robust 2.35:1 1080p AVC transfer. Skin tones are frequently warm and natural, yet they fluctuate appropriately with the cooler, somewhat teal-tilting color temperature in spots. The contrast balance elevates the cinematography's depth through stable shadows and controlled brightness levels, leaving only a few intentional scenes -- such as most of Rutger Hauer's time onscreen -- cloaked in information-killing darkness. Fine details and firm textures both produce exceptional clarity especially noticeable on skin and a few stony surfaces. Underneath a veil of convincing film grain that isn't messed around with by compression, this Blu-ray transfer's a hit. Unfortunately, the only sound treatment comes in the original 2.0 PCM track, and it's not the greatest. Granted, most of the action-movie intensity gets a pass without too much scrutiny, where the pop of gunfire and the slamming of bodies offer reputable bass response and a few high-end strengths. The subtle hiss of gas and the twang of radio distortion over voices are also discernible in the track, revealing some nice clarity. There are several interior scenes that struggle with too much of a dull echo, though, especially in the hallways and corridors outside the swimming pool area, and there's oftentimes not a lot of channel separation at the front, leaving sound effects to bluntly pour out from the front channels. For the most part, however, considering the limitations, it sounds fine enough. Nothing beyond a Trailer for the film, and other MVD titles. If you're in the market for a Die Hard clone, I'd sooner point you in the direction of Skyscraper, Lockout, or even Dredd for alternate spins on the rescue-mission-in-a-building concept than Blast. Grim, lacking impact, and unaware of how to utilize either its ‘90s Olympics setting or the gravitas of Linden Ashby, it's an empty-headed action flick that lacks an element of fun in the absence of originality. Skip It.